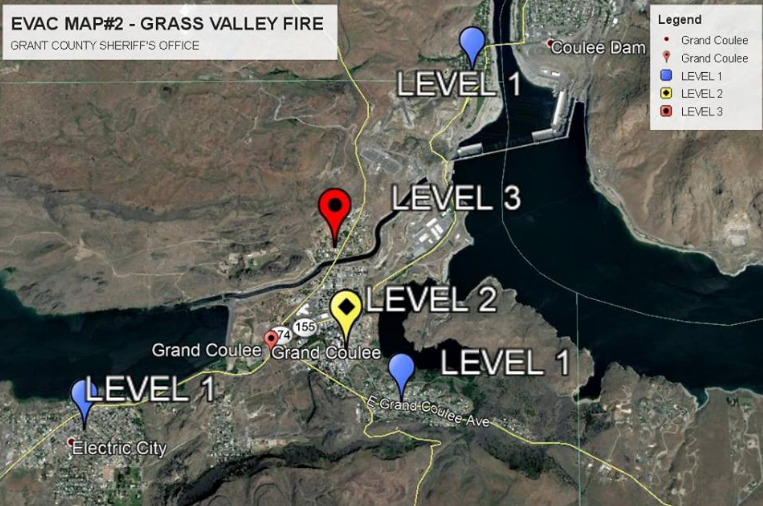 UPDATED: Sat., Aug. 11, 2018, 11:10 p.m.
A firefighter was injured and parts of the towns of Grand Coulee and Coulee Dam were evacuated Saturday as windy conditions created a roaring wildfire in central Washington. The fire, called the Grass Valley fire, started in late morning. By 1:45 p.m. it was 1,000 acres and required mobilization of state resources, said Kyle Foreman, Grant County Sheriff’s Office spokesman. As of 9:30 p.m. Saturday, northwestern sections of the towns were under level 3 evacuation notice, meaning residents should leave immediately. Foreman said the firefighter who was injured was flown to Harborview Medical Center in Seattle. Further information about the incident, including the agency the firefighter works for, was not available late Saturday. The State Fire Marshal’s Office reported that the fire started near Mansfield in Douglas County and was burning in grass, brush and timber. A Red Cross shelter was being set up Saturday night at Wilbur High School, Foreman said. Published: Aug. 11, 2018, 10:42 p.m. Updated: Aug. 11, 2018, 11:10 p.m.